This wet and cold weather will soon kill off the remainder of our summer insects, but quite a few of our butterflies will survive by hibernating. These include the Brimstone, Comma, Peacock, Small Tortoiseshell and to a lesser extent the Red Admiral (as the majority of these will migrate south back to the continent). However, the business of finding a suitable spot and settling down for winter is a gradual process. 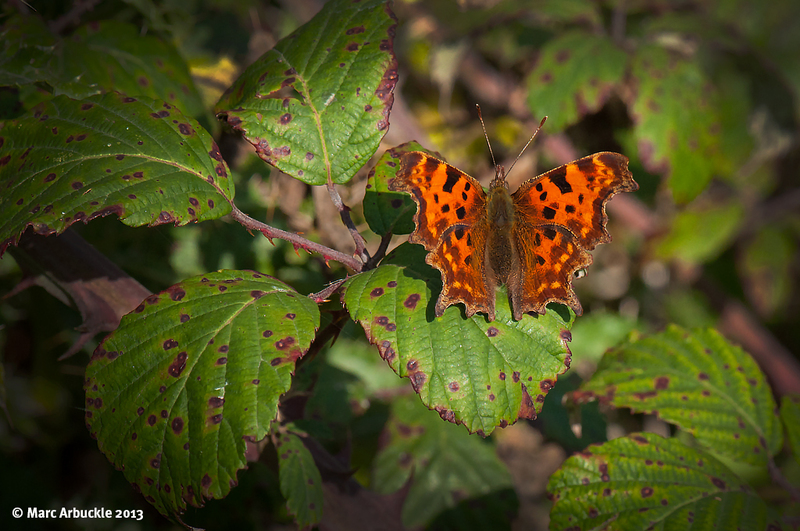 So it is still possible to see a few butterflies on a sunny autumn day, particularly if you scan a good patch of bramble. My current favourites are the pristine, late-emerged specimens of the Comma Polygonia c-album. Basking in the sun with their wings wide-open these raggedy-edged, spiced-orange beauties really do stand out against the dark green leaves. But when, as in the photo below, they have their wings folded, they can be slightly harder to spot. But that’s a good thing as it is this dark cryptic camouflage and irregular outline that will help keep them safe amongst the dry leaves of winter. Hiding them from the prying eyes of hungry birds and spiders. 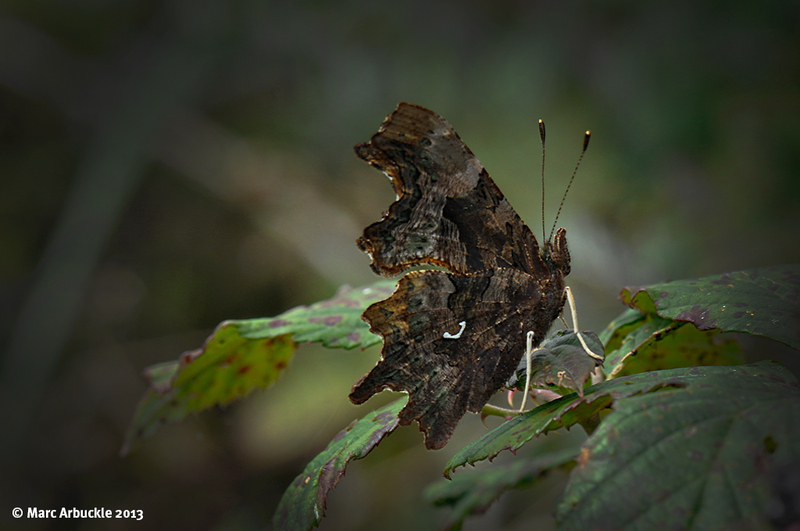 Note the characteristic white mark or ‘comma’ on its rear underwing which gives this butterfly its common name. Personally I think it looks more like a squashed ‘v’ but let’s not get into an argument over aurelian typography. If it survives the winter then it can be one of the first butterflies on the wing next year with sightings as early as January. And I for one will be glad to see it. I love macro photography! Well done! Like the photo of the ivy berries.